"Your family will shout, 'Olé' when you bring this Spanish-inspired meal to the dinner table. 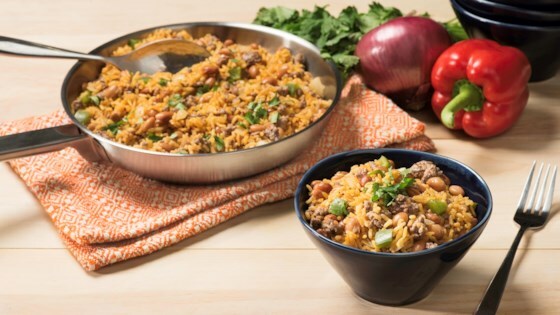 Filled with beef, beans, and flavorful rice, it's so simple and so hearty at the same time." Stir in pinto beans, UNCLE BEN'S(R) Flavor Infusions Spanish Style Rice, and water. Keep stirring to combine. Needed seasoning, but made for delicious taco salads! This came together quickly and was very filling. For me it was a little bland and in need of salt. My family thought it was great as it was. I would definitely make it again.